West Ham may have competition if they hope to sign Manchester City youngster Kelechi Iheanacho this summer, with John Percy of the Telegraph reporting that Leicester City are in for the the striker. This news doesn’t come as a huge surprise after bookmakers slashed odds on Kelechi to Leicester, making the 2015-16 Premier League champions odds-on favourites for his signature. But confirmation from the reliable John Percy means that City now have another player in the race for the Nigerian. 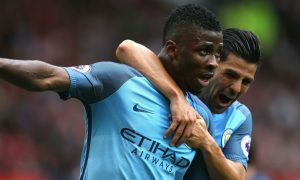 It is thought that City are playing hardball over any deal for Iheanacho, holding out for at least £25 million and wanting to insert a buy-back clause in any deal due to the player’s great potential. With Craig Shakespeare adding Iheanacho to his summer wish-list, it may prompt West Ham to agree to City’s demands or risk losing him to a Premier League rival. There is also considerable interest from abroad in Kelechi, who has scored 21 goals in 64 appearances for the Blues – many of them as a substitute. Video: Is this the performance that won Ederson a move to Manchester City?